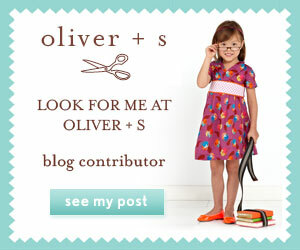 I feel I am getting into my stride now matching Oliver + S patterns to our school dress codes. This is the first time I have made a summer dress and the Jump Rope Dress pattern is the perfect mix of smart yet girly. This view A and will be my second time around with this pattern. I had a spot of bother with the collar on this one. The fabric is a cotton//poly mix and was a bit more slippery than the quilting cotton I used last time. It took some smoothing and adjusting but I finally got it to sit correctly. I find that with a lot of patterns I have to add length on but happily this is not one of them. The hemline sits just below her knee (this is the size 6) and there is plenty of volume in the skirt area for movement. I love this pattern for all its little details like the sleeve tabs with buttons and the large skirt pockets with fold over flaps. Only 3 weeks of term left but the weather is bright enough for gingham dresses and that makes us both happy! Very pretty in blue gingham! Thanks, I love that I have a little girl who adores wearing dresses. She is so good! Thank you! Making this pattern again is a gentle reminder that I really want to make view B but I will have to wait for a cooler season to justify a sewing craving! This is perfect! I'm a big fan of Oliver + S patterns. I'm planning to make my daughter a pair of Oliver & S After School pants in grey school fabric when she outgrows her current school pair. Thank you! The After School pants fit so well, they would make great school trousers.